Rescuers from several nations are trying to reach a seriously injured Indian sailor who is taking part in the Golden Globe round-the-world race. Race organisers said Tomy was "incapacitated on his bunk inside his boat.... as far from help as you can possibly be". "He is injured inside the yacht so he can't communicate further," an Australian Maritime Safety Authority spokesman told AFP news agency. 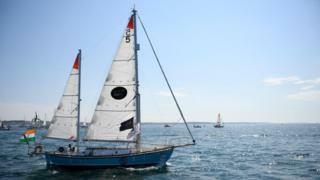 His boat, the Thuriya, is a replica of Robin Knox-Johnston's Suhaili, winner of the first Golden Globe Race in 1968. On Saturday, he sent a message, saying: "Extremely difficult to walk, Might need stretcher, can't walk, thanks safe inside the boat ... Sat phone down." An Irish race competitor, Gregor McGuckin, whose own yacht was damaged in the storm, has made repairs and is attempting to cover the 150km (90 miles) separating him from Tomy's position. Meanwhile, race organisers say a search and rescue plane is being sent to Reunion Island to help the rescue. An Australian frigate with a helicopter on board is also en route, but could take at least four days to reach the area, organisers say. The Indian navy says it has also despatched two ships to join the rescue efforts, the PTI news agency reported. Friday's storm whipped up 70-knot winds and 14-metre (45ft) waves, which also knocked down the yacht of another competitor, Dutchman Mark Slats, twice.